In September Joan and I had to start school, Joan in first grade and I in second. We were enrolled in East Concord Elementary and had to ride a school bus to get there. 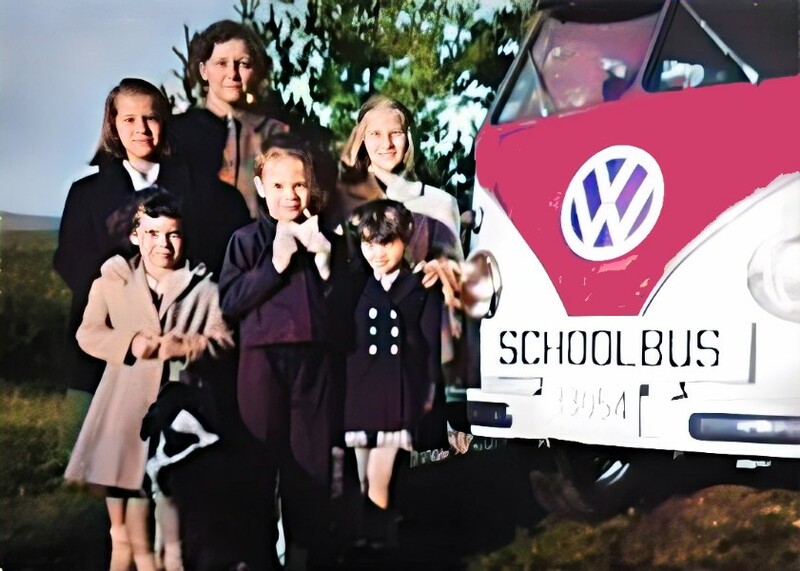 Our "bus" was a VW microbus driven by either Mr. or Mrs. Carpenter. Mrs. Carpenter also ran the cash register at the grocery store in East Concord, so taking kids to school was probably just a little extra money-maker. The other passengers included the four Rainey girls from Gallup Mills, and Richard Beck from North Concord. There were one or two others who rode with us occasionally, but usually got rides from their parents. I had hated my first grade teacher in New Jersey. But I loved Mrs. McGinnis, my teacher in East Concord. She was pleasant, pretty, and always wore a smile. One day after school I asked if I could give her a kiss goodbye and she let me peck her on the cheek. After that, I'd have taken a bullet for her. Waiting in the schoolyard for the bus back home was more of a challenge. A bigger boy—perhaps third grade, or even fourth—decided to push me around one day. Literally. He shoved me into the path of an oncoming car. In self-defense, I grabbed his sweater and wouldn't let go, so when he tried to push me, he'd follow. That was all I did, but by the time I got home, somehow Mom and Dad knew I'd been "in a fight." Dad was proud of me, until Mom scolded me for fighting. Then Dad had to swallow his grin and agree. Neither of them asked for my side of the story.